We made a few color changes and, of course, had to redesign for size so it would fit his opening. Fortunately, Ron lives only 3 hours from me, so he was easily able to drive over and pick up his new transom. Ron was nice enough to send along a great "after installation" picture. What a really nice installation job! 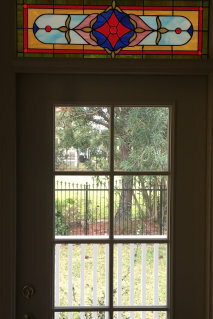 Ron called me about building a transom for his home in New Orleans. He was removing a window and installing a door in it's place ..... and thought a transom above his new door would add some color to the room. 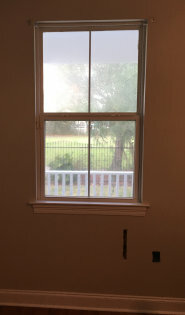 To the left is his original window. For the transom opening above his new door he wanted a transom similar to one I had previously built called Lauren's Transom. This was a redesign of a 100+ year old Victorian transom presently in a church in Greensboro, Alabama. Ron's Transom measures approximately 12" x 36" and contains 99 pieces of glass. It was completed in November of 2016 and enjoys it's new home in New Orleans, Louisiana.